Hollywood! Ur doin’ it rong! Last night I finished Uncharted 2 on my PS3. I stayed up til 11.30 playing it, having solidly worked on it over the past four nights. This is the most obsessed I have been about a game (not counting Rock Band which is a little like crack addiction for me) for a long time. The reason? The game is fabulous. It’s like a film. An extremely well written, well acted, fantastically produced and shot film. The story is tight, the action well executed and there is a genuine feeling that you are compelled to know what happens next. From the opening sequence which sees our hero, Nathan Drake, climbing up a train dangling over the edge of a cliff, to the climactic battle, every frame, every asset used in this game demonstrates a labour of love from it’s developers. 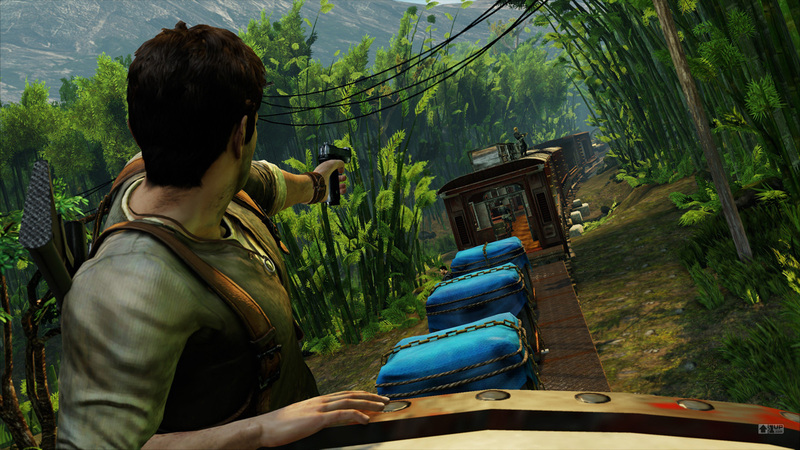 It’s a credit to the team at Naughty Dog and I cannot wait for Uncharted 3. So what does this have to do with Hollywood? Well, a couple of weeks ago information started trickling along the grapevine of a movie adaptation of the Uncharted series, to be directed by quirky indie bod David O. Russell, starring Mark Whalberg as Nathan Drake. Allegedly the story would revolve around Drake, his father and uncle as “relic protectors”, based in New York, dealing out justice to unscrupulous collectors and curators around the world. That doesn’t sound remotely like the games it’s purporting to be based on, which play out more like classic pulp adventures ala Indiana Jones, and leaves a strong taste in the mouth that Hollywood will, once again, completely miss the mark with a game-to-film adaptation. Okay, so I’m judging a product here that hasn’t even started filming yet, but it still begs the question “Why can games ape movies so well, but movies of games fall so flat?” On a whole, game adaptations seem to ignore the fact that their source material often comes with perfect stories, ripe for adapting. They seem to feel that simply crafting a story around a concept, throwing in familiar characters and some subtle (and not so subtle) nods to the source game is enough (Mario Bros., Street Fighter, Resident Evil, Doom – I’m looking at you guys!) I have about three game adaptations that I feel have hit the mark and delivered a product that is worthy of its origin. Two could be classed as guilty pleasures (Mortal Kombat and Tomb Raider) while one is damn near perfect (Silent Hill). But these three are still flawed in their own rights. I’m still holding out hope that the producers on Uncharted can craft a film that is worthy of the game and prove that, done right, a game-to-film adaptation can deliver a truly exceptional piece of entertainment, however I remain pessimistic. In an age where big budget Hollywood films continue to disappoint me on a whole, video games are providing some of the most compelling, well written works of fiction I’m experiencing.